On first glance this might seem like a bit a fool’s errand, as the Aztecs didn’t generally have any of the ingredients you might normally bake with: no wheat, dairy or chicken products, so no flour, butter or eggs. The lack of sugar also looked like being somewhat challenging. I thought I’d start easy, by following a recipe someone else had come up with for cornmeal cookies. This didn’t fit with all of my self-imposed restrictions, essentially just replacing wheat flour with cornmeal (polenta), but it seemed like a good idea to start simple to get a feel for the Aztec’s main staple. These cookies tasted pretty good, but the texture was quite peculiar – melt in the mouth, but in a strangely gravelly way. To avoid the granularity with my first fully restricted experiment, I tried using cornflour rather than cornmeal, which didn’t quite have the desired effect. I also found agave syrup for sale while looking for something else, but the only other structural ingredient was cocoa powder. There was too much cocoa, and this was also my first ever use of allspice. The combination made the results quite bitter, and thanks to the cornflour, the texture was very rubbery. Not a great success. On the next attempt, I went back to cornmeal, as I thought I could cope with gravel much better than rubber. I also increased the agave to cocoa ratio, and massively reduced the allspice. 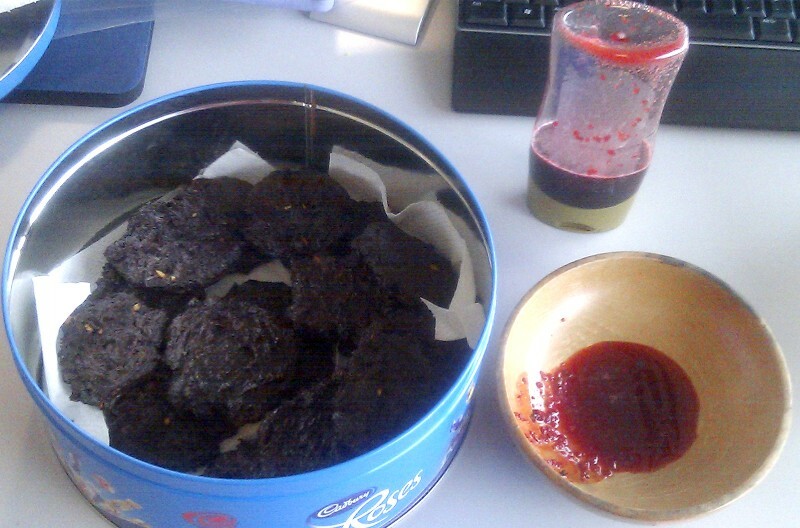 The Aztecs were big on blood sacrifice, so I also attempted to make some fake blood to decorate the cookies with. Cochineal seemed a bit extravagant for this experiment, so I just used synthetic colouring to redden some cornflour paste. Sadly, after baking, the “blood” had lost almost all of its colour. Worse, the changes to the cookie dough were pretty ineffective, and although most of the rubberyness was gone, the taste was still fairly horrible. I’d also thrown in a few cashews this time, but they were of little benefit. I did some more research on Aztec food at this stage. Although they didn’t have chickens, the Aztecs did have ducks. I didn’t find any explicit mention of them eating the eggs, but they must have done, right? Although I’d tried cashews last time, it had somehow slipped my mind that the Aztecs invented peanut butter! These two additions to my allowed ingredients made a huge difference, and the resulting products were much more like cookies than the rubber bricks of previous attempts. They also tasted a lot better, but there was still plenty of room for improvement. I had to give up on the allspice, though. 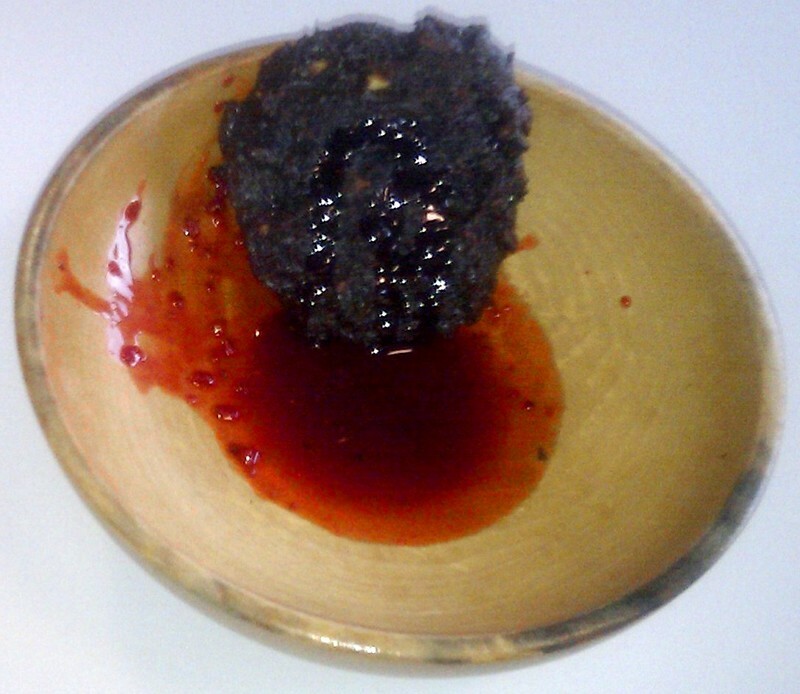 The next couple of weekends’ experiments mostly refined the proportions of the ingredients, but I also had a sudden inspiration about the blood. I was reminded out of the blue that blood effects in horror films are often produced with corn syrup, which fit right in with the restrictions I was working under. Obtaining corn syrup at a reasonable price in the UK didn’t look feasible within the time I had left before my birthday, but I already had the agave syrup. I got a really good colour match with the food dye, but it didn’t have quite the consistency I wanted, so I thickened it a bit with some cornflour. That overpowered the taste of the syrup, but I figured out a workable alternative in the final experiment. This is much less precise than the cookies recipe, as it depends a lot on your taste. Also, I was making it up as I went along, and forgot to weigh anything until it was too late. This ends up being pretty sticky, so if you can mix it all up in the final receptacle, you won’t lose any. You’ll also save on the washing up. Pour some honey into a bowl. This is the major ingredient, so you need at least two thirds as much honey as the amount of the final sauce you’re after. Stir in enough red colouring to get the almost the depth of colour you want. It doesn’t matter if you put slightly too much in, because the next step will dilute things a bit. Don’t go overboard though, as it’s not possible to get it exactly right at this stage. I’d suggest doing all of the colouring later in the process, but doing most of it here makes the next step much easier to judge. Unless you’re going to serve this heated for the full effect, honey is much thicker than blood, so gradually stir in enough agave syrup to thin it down. It needs to be mixed quite thoroughly, so be careful not to add too much too early. Stir in the chopped chillies, and enough salt to be able to taste it, but without overpowering everything else.